What a good place to live but in New Jersey. I have seen nice pictures from my cousin who lives in New Jersey and gush the place is awesome. His ocean front luxury condos is just right for him as a bachelor. His parents live in New Jersey too and they owned a waterfront home just right for them and the two children. They all loved there I don't know if they can find a place that they so loved. They are so thankful that they find a good New Jersey real estate broker or else they couldn't find such a very good homes to live by. Last weekend we went to Plymouth, Michigan to watch the Ice Festival. The Festival was held in the park in the middle of the city. As we walked through the streets I saw this beautiful house. I like it very much and so the color how about you? and every time she caught me still cross-stitching at the wee hours in the morning she really told me that in due time my eyes will be worn out. At young age do you care? Nope it doesn't for me instead I continue to do my cross-stitching. Until I reach the age of 40's then I felt that hey something is going on with my eyes I can't see far and had a hard time reading the fine words. Hubby told me to get an appointment for eye check-up. So I did after the examination the doctor gave me an eyeglasses . Photo Hunt once again and the theme is about Balance. Here is what I come up with the theme. This is the Mackinac Bridge, I've crossed this bridge for so many times and I am still wondering how they balanced all the beams and ropes and what ever they put in that bridge. For me it is amazing and with stories that comes with it makes it a little bit creepy, boo! ^_^ Here are my pictures. Window views & Doors too: Different design.. So it's window views and doors once again hosted by MaryT. My entry for today is the house which I find very different compare to what I see here in my area. My first time for me to join the meme called Heads or Tails...and this week theme is PACK!! I did browse right away my picture folder and found this one a packed of MANGOES. This variety of mango is just one among the many varieties of mangoes that you could find in the Philippines. This one is very sweet though we call it evergreen but they get yellow too. So here is my pack for this week. Went to visit one of my favorite thrifty store last week. It was very chilly but still manage to take a photo can you guess what's the name of this thrifty store? For more Window&Doors entries join and visit HERE! It's very hard to get a picture like this specially in our kind of weather. Always all the time the sky is cloudy, dreary but this particular afternoon the sun came out. The ground is covered with snow outside was cold but I manage to get at least two pictures can't resist the beauty of this sunset. 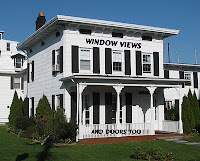 My first time to join Windows views and doors too hosted by gorgeous MaryT . I ask the concierge if the number etched in the door is right, and he says it is right. The number etched is year 1856 my eyes popped out. I can't help but touched it you know. I imagine people touched it from way back 1800??? How is that? Love to go back to that restaurant again it has a lot of history to tell and I like to touch it again hehe. This is the outside of the restaurant and this part is already renovated but they keep the stained glass window, doors and some woods. It's Sky watch Friday once again and my first post for this year 2010. This was taken last night the sun didn't come out as well as the moon itself. I was watching the sky the whole night to catch up the blue moon but the cloud are just too thick the moon can't come out. Thankfully I had this one. Happy New Year to everyone! !